Fermilab | Science | Questions for the Universe | Einstein's Dream of Unified Forces | Do all the forces become one? Are there undiscovered principles of nature: new symmetries, new physical laws? How can we solve the mystery of dark energy? Do all the forces become one? Jonathan Bagger, professor of physics from Johns Hopkins University, explains how string theory has the potential to make Einstein's dream of a single grand unified force come true. At the most fundamental level, particles and forces may converge, either through hidden principles like grand unification, or through radical physics like superstring. 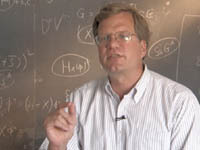 We already know that remarkably similar mathematical laws and principles describe all the known forces except gravity. Perhaps all forces are different manifestations of a single grand unified force, a force that would relate quarks to leptons and predict new ways of converting one kind of particle into another. Such a force might eventually make protons decay, rendering ordinary matter unstable. High-energy particle physics experiments are exploring the unification of the weak and electromagnetic forces. Does the unification continue? At the most fundamental level, particles and forces may be related, either through hidden symmetries like grand unification, or through radical physics like superstrings. Essential clues can come from laboratory observations of extremely rare particle decays and other rare processes, as well as from precision measurements at the highest energies. Such breadth of approach is necessary because we do not know where the clues will appear. Models of grand unification predict that protons may eventually decay, rendering ordinary matter unstable. The Super-Kamiokande detector already has sensitivity to proton decay in the range suggested by models of grand unification. The next generation of proton decay experiments will require larger detectors in an underground laboratory. Unification physics represents a natural mechanism to provide Majorana masses for neutrinos, in which case neutrinos are their own antiparticles. This possibility could be verified by a positive signal in the next generation of neutrinoless double beta decay experiments, for example EXO or Majorana, at an underground laboratory. The precision measurements of the force strengths at LEP and SLC provided circumstantial evidence for grand unification. Ultimately, unification of all the fundamental forces requires an understanding of quantum gravity and the associated exotic phenomena, such as black hole evaporation. Progress could come serendipitously from a discovery of extra dimensions at the LHC, or of anomalous gravity wave sources with LIGO, or of unexpected events in ultra-high-energy cosmic rays, including cosmic neutrinos.